Heading up the sunny slope of Grjotlia, feeling very optimistic about finding some neat terrestrial invertebrate lifeforms to sample. I know from earlier walks that this particular slope has a rich lichen vegetation, amongst them the black kind that the mites supposedly like best. It's also a sunny day - warm mites move quicker and should be easier to spot. Apparently not my lucky day: no movement what so ever - in, under, or anywhere within 2 meters of the lichen. The dominant lichen on this hill is the orange crustose type. It seems to prefer cracks on top of big, flat boulders. Absolutely no sign of mites, though. Getting slightly frustrated now. This snow petrel chick cheers me up, and I start digging around the guano and algae piling up underneath the nest, but to no avail- absolutely nothing that even resembles a small creep. One of many empty-handed returns to the snowmobile. Saturday we had a big party to mark the end of the summer season. In 2 days only 6 will stay behind. 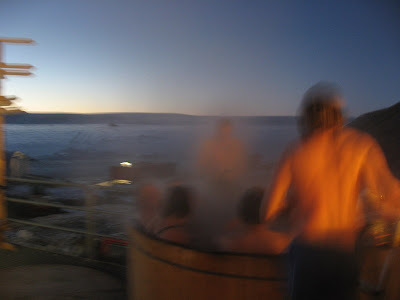 We marked the occasion by setting two new Jakuzzi records - 19 people in the hot tub at the same time, and around 17 of them stayed in the tub for 7 hours straight. Personal space requirements went out as 8 bottles of champagne went in. I chose this particularly blurry picture in case anyone from the team wants to go for american president. I'm about 4 km from Troll, looking back towards the station from within a lowlying moraine field. It's a partially overcast day, relatively warm at -6 degrees, but it feels colder because of the wind. Walking amongst these boulders for half an hour, there's no sign of what I'm looking for. I've chosen this site because the northwest-facing location gives maximum exposure to sunlight, hence more heat, more snowmelt and humidity, and more chance of finding life. Even still - the rocks, the patches of sand between them, the gravel, the small shelters underneath the bigger rocks, the small meltponds forming there - all seem lifeless. I decide to try try for slightly higher ground, and head towards the moraine-covered slope below the small glacier cap. As I approach the hillside, the winds drop, and there's less snow cover. Happy with this decision, I start searching for the largest boulders, because bigger boulders means more stability, and more stability means sufficient time for lichen to grow and establish itself. Finally - a small patch of lichen of just the right type - leafy, black, and crumbly - an "epilithic foliose lichen". To speciate it properly, someone with more than a hobby-based interest in biology would have to examine it under microscope. Even still (I enjoy guessing) - I think this lichen might be called Umbilicaria decussata. It's not restricted to the Antarctic - cousins of this lichen actually grow back in Norway, and can be used as emergency food if you just happen to be stranded on a barren island or mountain without provisions, and are feeling desperate, adventurous, or both. In any case, lichen tasting is not what I've come for, either, but the small patch of lichen means I'm at least in the right microhabitat now. I start turning rocks over, inspecting their undersides carefully with my hand lens, small brush and vial of ethanol at the ready. First rock: nothing. Second: is that something moving? Yes - along a small crack in the rock, a tiny creature, red legs and black body, barely half a millimetre across, walking sluggishly along, it's world suddenly (and literally) turned upside down. With shaking hands I scrape it up with the brush, and condemn it to quick death by alcohol. Success! This is what I've come for - in this case I've found a tiny mite, but actually anything small that moves would be interesting. After collecting two vials of 10 mites each, I head back to station and put one under the microscope. Most probably this is mite is called Eupodes angardi. It's one of 10 or so species of mites in all of Dronning Maud Land. In addition there are 2 species of springtails, another group of terrestrial microarthropods. So - have I gone crazy in my search for life in an apparently lifeless place? Regulations about wildlife collection tossed out the window, just to satisfy my own overgrown curiosity? This mite is going to the University of Stellenbosch in South Africa, for closer examination and DNA analysis. Through a happy mix of coincidence and me not being able to keep my mouth shut, I've managed to recruit myself as assistant microarthropod collector on behalf of Jen Lee, a South African biologist who has been sampling mites and springtails around SANAE station this summer. Her project is part of a big International Polar Year research project called "Aliens in Antarctica". The project wants to assess the risks to Antarctic biodiversity with increasing human traffic around the continent. The mite above is not an alien, but a resident mite carefully adapted to the freezing environment, living off the sparse detritus from the black lichen. But, theoretically, mites could get transported between nunataks on the clothes and shoes of researchers or adventure tourists, and both inter-nunatak and intra-species biodiversity could be at risk. Before someone goes out and examines these fragile ecosystems, by physically sampling these tiny animals from different locations, and by genetic analysis calculates their relatedness, we don't know much about this risk at all. I'll be on the search for mites and springtails in the areas around Troll up until leaving (running out of time!). Nothing better than having a good, even scientitic, excuse for goofing around with my magnifying glass. Yesterday I was exploring Nonshøgda, the low mountain immediately to our north, looking for life both tiny and small. The weather was splendid - blue skies and around -7 degrees, slightly unexpected because over the last weeks we've have had a gradual yet marked change in light and temperature: we have sunsets now, night temperatures drop below -20, and most of our bird neighbours seem to have left us. The last transport train, number 8, approaching Troll. Every last container has now been shipped to station from the ice shelf. Fuel, food and other supplies for the 6 overwinterers - it's all in place. The main mission for the summer season has been accomplished. We're now wrapping up for the season, doing building repairs and improvements, and in my case the overlap period with my replacement, the overwintering doctor, has begun. In 10 days I'll be back in Cape Town with the rest of the summer team. It's been a fantastic 3 months, possibly life-changing, and I can't believe how fast it all went. Climbing the hill further, I came upon a small patch of green, almost salady stuff, scattered amongst the rubble beneath some big boulders. This is a multicellular algae, I think belonging to the genus Prasiola. It usually grows in small cracks like this, small wind-deposits of snow providing liquid water for the brief summer months. They're not easy to spot, these tiny snow petrel chicks. He was sitting in a small "cave", generations of guano piled up by the entrance, small bits of which provide plenty of fertilization for the Prasiolas below. No sign of parents. With a healthy-looking chick like this, they are probably not far away, either on their way to, or coming back from the ocean, crops bulging with supernutritious krill-oil. The skuas will not be able to pull the chick out of his narrow hiding place. In a few years this chick might be greeting newly arrived station crew members, while busily squabbling for the best nest site and some female attention - warm childhood memories coupled with genetic conditioning will have brought him back here, to within meters of his own birthplace. 4 km north of the station is the low hill called Klovningen. The area north of it is heavily crevassed because of a glacier fall squeezing by. Immediately before the cliff face lies a massive wind-hole, called "Klovningsdella". It's not visible before the ice practically disappears under your feet (belts, in our case). You can enter this "secret valley" on foot from the south side only, elsewhere you would need climbing gear. It's a beautiful spot, with a flat blue ice "lake" glimmering on the valley floor, and a sizeable colony of snow petrels in the sunbathed and wind-protected scree slope. These are not snow petrels. We found a total of 54 empty fuel drums in the wind-hole - all of them blown here across the blue ice from the station during the november hurricane. Most of the barrels had aggregated in heaps under big rocks like this one. The rock seems to be resting on a pedestal, because the ice column immediately beneath it is shaded from the melting rays of the sun. We stuffed the barrels into a net, and pulled it up the steep slope by belt wagon. 2 seconds after this picture was taken, as the net was hanging right under the edge, the rope gave in to the snow friction. Ken, our expedition leader (small figure in the bottom right corner) turned his head, saw 30 barrels tumbling down the slope towards him, and ran for it. Next attempt, using a pulley system with 2 belt wagons and a crane on the edge, went without unpleasant surprises. Four of us decided to hike the steep north-eastern side of Stabben, the square-topped syenite landmark that should be well-known from previous blog entries. Joining us was Sune, the swedish/english field guide who just came back from a 2 month geological sampling expedition in our "local" mountain area. Yes, it's the 2-man team from the "Field trip" entry in december, finally back from the wilderness! The shower at Troll was put to good use. The expedition was rewarded with several hundred kilos of specimens for Horst to blast with his radiometric guns back at the University of Bristol. Particularly interesting are the samples from a supposedly 3 billion year old nunatak east of Jutulstraumen("Annendagstoppen") - measuring the age of this particular rock, using the latest methods (hafnium isotope analysis, to be exact), has the potential to shake the foundations of the Gonwanaland supercontinent theory (at least the part of it that claims East Antarctica was connected to Africa and India). I've always been a fan of paradigm-shattering. On the sunny side of the mountain. Highest form of botanical life around here: a moss cushion. Sunwarmed cliff providing heat; snowflake on the left providing water; weathered crumbly rock below providing nutrients. What more can you ask for? A small snowhill had formed along the side of the cliff. Looking back down to where we started from. Heavy crevassing apparent on the bordering ice sheet. We followed the narrow edge as far up as we could. Approaching Stabben from behind. The ice ridge turned out to be an effective route across. We carried ice-axes -useful to brake potential unwanted rides down the slippery snow surface. At the foot of the mountain we couldn't get any further without climbing the sheer rock face, something we were not equipped or in any case mentally prepared for. Sune, the professional mountain and climbing guide, getting lost in his own thoughts as he gazes up the sheer cliff surface, criss-crossed by massive granitic intrusions.